Heading home after a stay in the hospital is often a relief, but it can also be an uncertain, overwhelming time. You may have some lingering medical needs that make it difficult to do all the things you’re accustomed to, and that may also cause concern about whether you will be able to take care of routine household responsibilities. It’s important to have a good plan and support network in place before you head home so that you’ll be able to focus all your energy on recovering. The process of transitioning back home after a hospital stay can create challenges for you and your family, but it can also be a wonderful relief as you look forward to moving back into the comfort of home. Here are some tips to help you prepare both mentally and physically. Prepare a detailed transition plan. A transition plan can break an intimidating process down into manageable parts. Talk to your doctor and family members about post-hospital care, transportation needs, and rehabilitation expectations. Your plan should include any follow-up appointments you’ll need, a medication management strategy, and the potential need for additional care and assistance once you arrive home. Acknowledge that parts of your life might look different. For example, if you are used to walking every morning, handling all your own housework, and not needing help from anyone, it’s important to mentally prepare for a new routine. Accepting help from family, friends, and caregivers is one of the best ways to move back toward a comfortable, productive lifestyle at home. Don’t neglect the healing process. You most likely still have some physical limitations, and you may need additional therapy to recover from the injury or illness you experienced. Be sure to participate in this rehabilitation process and give yourself time to recover. You don’t need to jump right back into every activity you were doing before. Give yourself time to heal. Consider changes to your home environment. If you will be using a wheelchair or walker, you may need to install ramps, rearrange furniture, or make other structural changes to your home so you can move around more easily. Even if you don’t need assistance with mobility, it’s a good idea to consider safety measures such as non-slip treads on steps and in the bathtub, grab bars in the shower and bathroom, and nightlights in case you need to get up during the night. You may also want to move items you use regularly off of high shelves to reduce the need for step ladders or other fall risks. Ask for help. There is no shame in admitting you need additional help. You have been through a traumatic experience, and you will need time to recover following your hospital stay. Talk with your doctor about what you should expect in terms of recovery time and whether you will regain full mobility, and then reach out to family members who can help you make decisions about care. 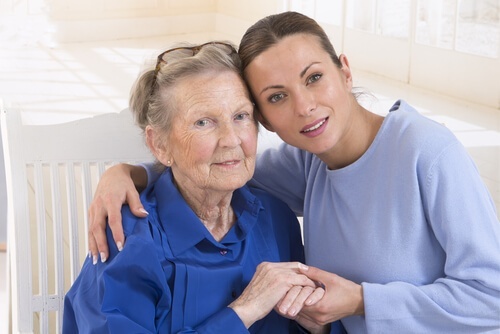 If you don’t have family who can come and help out, a professional caregiver can give you the help you need so that you can maintain your independence at home. Household responsibilities - Your caregiver can assist with meal preparation, light housekeeping, and even laundry so that you can get the rest you need without feeling overwhelmed by housework. Transportation to appointments - If you don’t have family nearby to help with transportation, your caregiver can drive you to any follow-up appointments you have with your doctor. Grocery shopping - Grocery shopping may seem like an overwhelming task if you are struggling to get around, especially if you have new dietary requirements following an illness. Your caregivers can help you plan meals and shop for groceries that meet your nutrition needs so you always have plenty of options on hand. Personal care - If you have a broken bone or limited mobility, a caregiver can help you with personal care needs such as bathing, dressing, and getting to and from the bathroom. What Are the Benefits of Home Care Services with Cherished Companions? At Cherished Companions, our goal is to help you enjoy your independence while creating a safe, comfortable environment at home. We customize care plans based on your individual circumstances, and we offer as much or as little help as you need. Customized Care Options - No matter how much or how little assistance you need, we will create a care plan just for you. From light housekeeping to mobility assistance and fall prevention, our customized options are designed around your unique situation. Flexible Hours/Shifts - Not everyone needs a full-time caregiver. That’s why we offer flexible hours and shifts, from two hours at a time up to 24-hour/live-in care. Regular Communication - We will keep you and your family informed about your progress each step of the way. You can even choose your preferred communication method, whether that’s phone, text, or email. Companionship - Physical limitations often affect your ability to get out and socialize like you used to. Our caregivers enjoy spending time with each of our clients, and we believe that this companionship is vital to the healing process. If you would like to know more about the caregiving options available to you, please give us a call. We would love to talk with you about how a caregiver can support you as you transition back home after your hospital stay.